Fun Tool To Calculate Value Of Your Vegetable Garden Produce! Click on image to estimate value of your home-grown veggies! With all the time we spend in the garden, we’ve always wondered the value that actually came out of it in monetary terms. Here’s a fun estimator that we came up with (you can also click on the image). Thanks in advance for your feedback and comments! We sure spend a lot of time babying our seedlings. We start them indoors where it’s safe from the elements. We start our seedlings in excellent soil. Sometimes we use warm water or a warming pad underneath to help germination and growth. They bask under grow lights to keep them from getting spindley or leggy. But guess what? 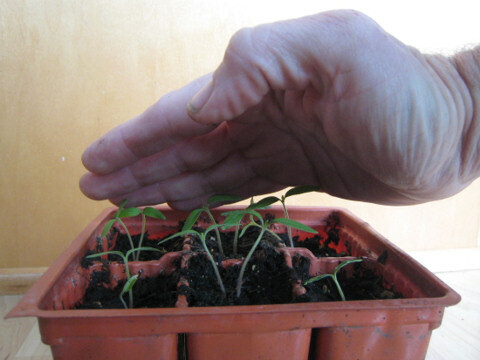 Your tomato seedlings need a good workout every now and then, too. Older seedlings can use a more vigorous workout! Once they have their true leaves, and seedlings are over 4 inches tall, your tomatoes can handle a more vigorous workout. For nostalgia and entertainment, whip out those old Jane Fonda or Richard Simmons videos to get you and your tomatoes in the mood. Grab the stems and bend them back and forth. Do this to the higher part of the stems so that you won’t disturb the roots. A couple of times a day should suffice. 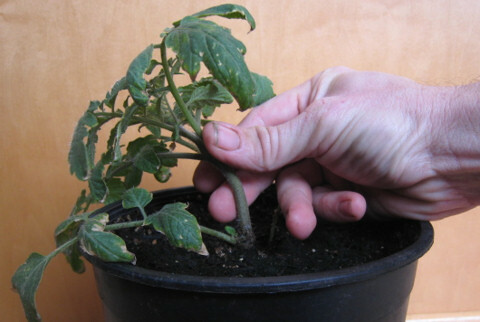 A research project from Cornell University and the University of Torino, Italy, showed mechanical brushing results in tomato plants that are shorter but stockier, have thicker stems, and are less likely to suffer transplantation stresses than seedlings that did not get a workout!